In an effort to get my life together I needed to come up with a new way to file my receipts. My washing machine broke about two months ago. We’d only had it four years and it was a fancy front loader so I was disappointed to see it break so soon. Well of course I contacted the manufacturer and of course had to produce my receipt which I knew I had somewhere in my file cabinet, but couldn’t find. I searched for several hours and finally found it only to learn we were a few months beyond the warranty, plus they did not cover bearing or drum issues. I don’t use profanity, but at this point I wanted to. By now, I’m frustrated, having spent several hours on the phone and searching for the receipt only to end up back at square one. I refused to repeat this scenario ever again which is what led me to todays tutorial. 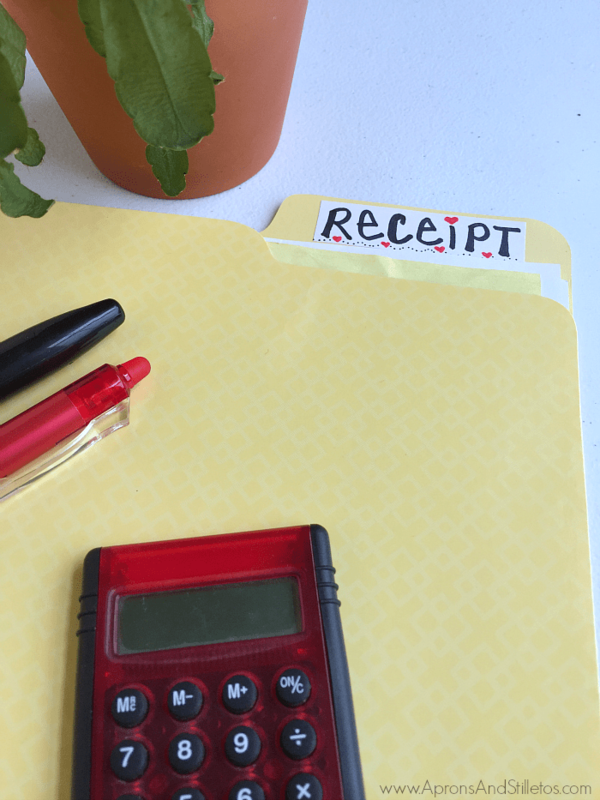 I’m going to share my really simple technique for keeping receipts organized. I decided to use a canary yellow file folder with some simple details, a baseball card sleeve and file folder label stickers to organize everything. The baseball card holder has three pockets across and three down which is enough to easily store nine long narrow receipts. To store the narrow receipts I just fold them until they are the same width of the baseball card sleeve opening. The baseball card sleeve is transparent so I can easily see the item purchased and find whichever receipt I’m looking for. For full page receipts, I just store them directly in the folder. I may add pronged fasteners later if the papers slip around too much, but for now this is perfect. Once I my current receipts were filed, I placed the folder in my file cabinet. Now when I get a new receipt all I do is grab this folder. 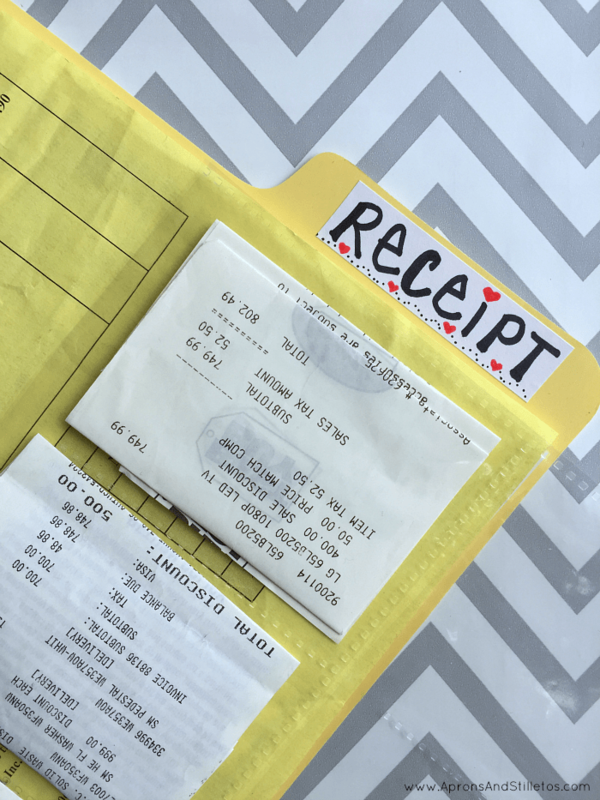 The only receipts I file are ones that verify the purchase of large ticket items or services. It’s quite possible that I’ll switch to using a 1/2 inch binder if my saved receipts become to thick to store in a folder, but for now, the folder works just fine. I know you guys are probably super organized, but can any of you relate? 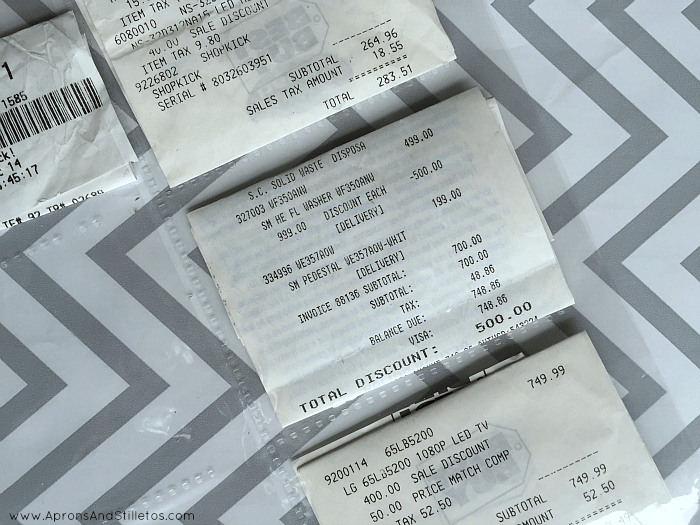 Is it receipts, tupperware lids or maybe your favorite coffee cup. What frustrates you when you can’t find it? This is genius! Right now I stuff all my receipts in an envelope, so this would be terrific to organize them and see them easier. 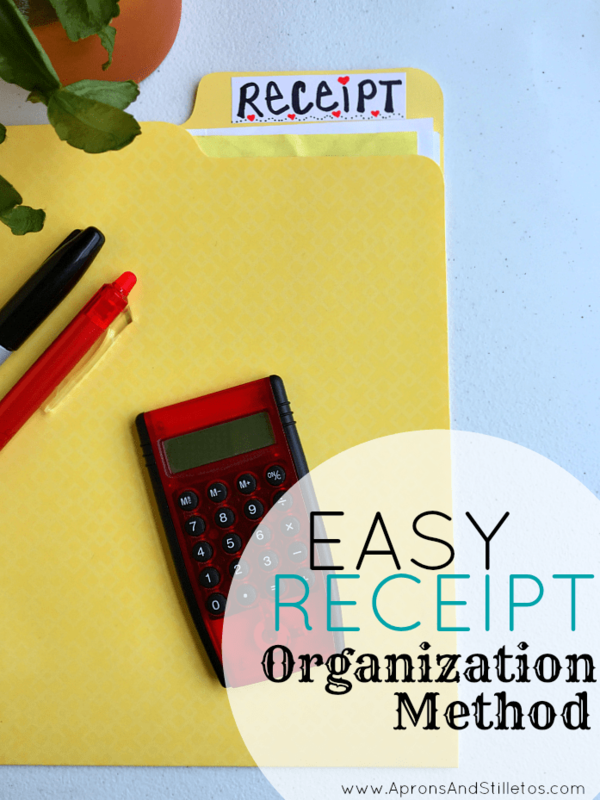 I need to organize all of our receipts now that tax time is coming. This is a great system for doing so. Oh man I'm horrible at this. I shove them all in my wallet till I can't stand it anymore and then just start tossing and hope it's not for something important. This is a much better system! I have all mine shoved into a box that then gets sorted out in February. Your version is much tidier! This is great! I keep everything in a filing cabinet, except my work papers- I collect those receipts by month in an envelope! Receipts have got to be the worst item to find when you actually need it!! I love this idea of using baseball card holders-really will make life a bit easier. These are some wonderful ideas. I too am a receipt saver. I mean as a mother I have no choice. And I have receipts everywhere. There's some in the kitchen drawers, some in my old purses and some in a plastic bag. Seeing this reminded me that I really need to get it together. Thank you so much for sharing. I need to do this. I've got receipts everywhere and when it's time to look for it, it's nowhere to be found. Back when I kept receipts, I used a similar organizational method. 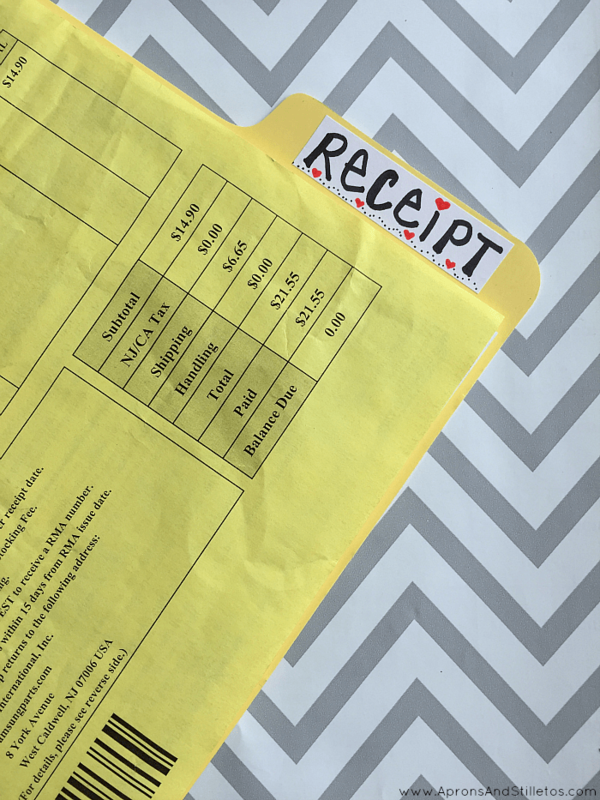 Since we now buy everything on credit cards and usually online, keeping track of receipts is even easier!